Request a quote for a bulk order for 5-methylcytosine (5-mC) monoclonal antibody cl. b - Classic. Please fill out the form here below. Your local sales account manager will get in touch with you shortly and send you a quotation based on your requirements. Monoclonal antibody raised in mouse against 5-mC (5-methylcytosine) conjugated to ovalbumine. Human, mouse, rat, cow, alligator, zebrafish, plants, finch, wide range expected. Monoclonal antibody purified by gel filtration. * Please note that of the optimal antibody amount per IP should be determined by the end-user. We recommend testing 0.5-5 µg per IP. 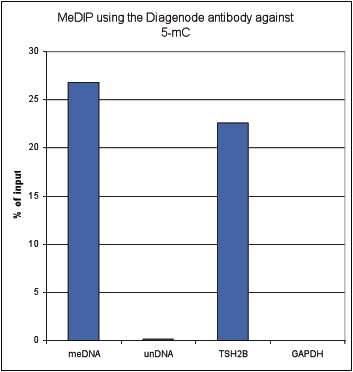 MeDIP (Methylated DNA immunoprecipitation) was performed on 1 µg fragmented human genomic DNA using 0.2 µg of the Diagenode monoclonal antibody against 5-mC (Cat. No. C15200006) and the MagMeDIP Kit (Cat. No. C02010021). The fragmented DNA was spiked with the internal controls present in the kit (methylated DNA (meDNA) as a positive and unmethylated DNA (unDNA) as a negative control) prior to performing the IP. QPCR was performed with optimized primer sets, included in the kit, specific for the methylated and unmethylated DNA controls, and for a known methylated (TSH2B) and unmethylated (GAPDH) genomic region. Figure 2 shows the recovery expressed as a % of input (the relative amount of immunoprecipitated DNA compared to input DNA after qPCR analysis). HeLa cells were stained with the Diagenode antibody against 5-mC (Cat. No. C15200006) and with DAPI. Cells were fixed with 4% formaldehyde for 10’ and blocked with PBS/TX-100 containing 1% BSA. The cells were immunofluorescently labelled with the 5-mC antibody (left) diluted 1:1,000 in blocking solution followed by an anti-mouse antibody conjugated to Alexa594. The middle panel shows staining of the nuclei with DAPI. A merge of the two stainings is shown on the right. Diagenode strongly recommends using this:	5-methylcytosine (5-mC) monoclonal antibody cl. b - Classic (Diagenode Cat# C15200006-100 Lot# GF-005). Click here to copy to clipboard. Developmental origins of transgenerational sperm DNA methylation epimutations following ancestral DDT exposure. Mercury-induced epigenetic transgenerational inheritance of abnormal neurobehavior is correlated with sperm epimutations in zebrafish. 3/16 Epigenetic Programming Alterations in Alligators from Environmentally Contaminated Lakes. Guillette LJ Jr et al. Prenatal Exposure to BPA Alters the Epigenome of the Rat Mammary Gland and Increases the Propensity to Neoplastic Development. Dynamics of 5-hydroxymethylcytosine and chromatin marks in Mammalian neurogenesis. 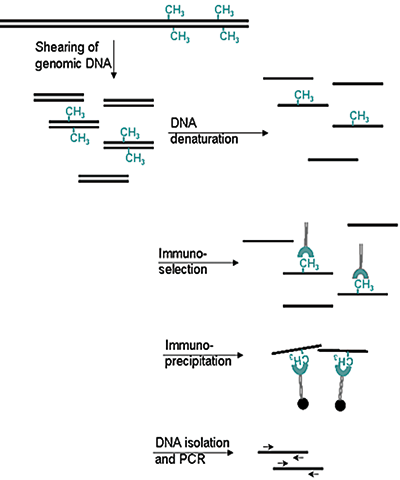 Comprehensive analysis of DNA-methylation in mammalian tissues using MeDIP-chip. Microplate-based platform for combined chromatin and DNA methylation immunoprecipitation assays. Genome-wide conserved consensus transcription factor binding motifs are hyper-methylated. The epigenetic landscape of latent Kaposi sarcoma-associated herpesvirus genomes. Genome-wide analysis of aberrant methylation in human breast cancer cells using methyl-DNA immunoprecipitation combined with high-throughput sequencing. Genome-wide high throughput analysis of DNA methylation in eukaryotes. Methylated DNA immunoprecipitation and microarray-based analysis: detection of DNA methylation in breast cancer cell lines. Chromatin immunoprecipitation analysis in filamentous fungi. Boedi S, Reyes-Dominguez Y, Strauss J.